If you’re someone who enjoys a more technical post, this isn’t it. But I think there are some elements to this post that will apply to the thought process of people in just about any role. Here we go. There’s a reason I’m here today that I can’t explain in a brief conversation, but it’s something I need you to know. Take a second, and go on this flashback with me. I want you to see how this played out through my eyes. My wife has been a REFIT instructor for a couple of years, and I know a number of times she has wished I would come to the classes with her. The problem is I am not coordinated enough to be able to do the dance moves. And that inability to do the moves correctly frustrates me to the point where I don’t have a strong desire to attend, even after we practice some of the songs together. Last year my wife told me about a new REFIT curriculum called REV+FLOW. It was supposed to be low impact, high intensity, and all about increasing flexibility and mobility. Even more than that, the moves would be less dance oriented than REFIT and easier to follow for someone like me. When she told me about it and encouraged me to take the classes with her, I knew she wasn’t going to force me to attend (as if she could be successful with that). She said her instructor friends wanted to see how the class would affect both males and females. It was a mere suggestion that might help me accomplish my own goals. She cared about my health and fitness. And it was once per week on Saturday mornings for a 12-week period. That’s not much of a commitment, right? Since taking a desk job years ago and having a kid I have become less and less active. Since working from home in a field facing role over the last year, my activity level has lessened to a greater extent. My wife knows deep down I don’t want to be the fat dad who can’t run and play with his child. I want to be healthier so I am not the old man with a massive gut who can barely move around some day. While I did not immediately dismiss the suggestion, I was afraid. Would I really be able to do the moves? And even more so, would I be able to do the moves without hurting myself? Would my wife laugh at me? 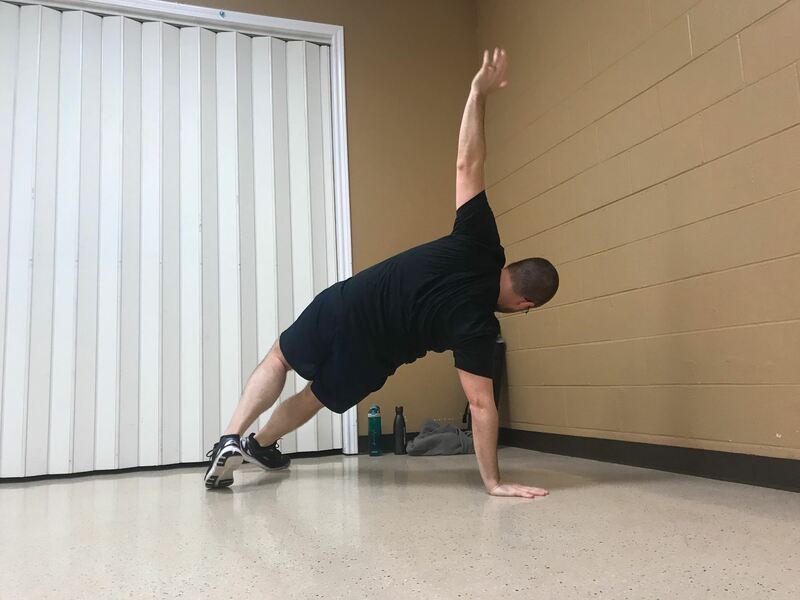 I had never been to a REFIT class outside of the videos my wife had showed me and what she had demonstrated at home, so it was difficult to know how different something like REV+FLOW be. That’s not the only fear. If I decided to go, I would be the only male. Perhaps that is a perk for some, but to me, humiliating myself in a room full of females who likely could do the moves better than me was not something on my bucket list. In fact, it was completely intimidating. I kept thinking about going. There’s a flip side to the intimidation feeling of being in the minority. Would the ladies attending feel uneasy with a single male being there too? Would it make them as uncomfortable as it might make me? At this point I had only my combined rational and irrational fears keeping me from agreeing to go. Finally, I told my wife the only way I would go is if the instructor could assure me no one else would feel weird about me being there. She said the instructor was fine with it and that the rest of the class would be too. Since I wasn’t some random guy and happened to be married to another REFIT instructor, it made things less weird. How great would it be to set an example for our daughter and for her to see mom and dad both working out so they can be healthier? It’s our job, after all, to teach her these things. Even though I would be doing this for me, I would be doing this for our whole family. I made sure to hydrate properly and eat a decent breakfast before we left for class, but I was a nervous wreck. Could I really do this? Did I really want my wife (and a room full of other ladies) to see me look like a goofball and not be able to do the moves? That didn’t matter now because I committed to doing it. When we arrived, my wife talked to the instructor and decided the best place for me would be up in the front and off to the side. That way I would not be standing behind anyone and would not make them feel uncomfortable. We did some stretching to prepare. And then it started. The routines done in REV+FLOW are still choreographed to music, but they are less dance and more bend / reach / lift / turn type moves. Regardless, at first I was having trouble keeping up and doing the moves just as the instructor did. I got mad at myself for not being able to do it initially. But that soon passed. I just focused on keeping up and doing the best I could to be in proper form to survive the class without injury. After 3 songs the instructor said “now our warm up is finished.” I couldn’t believe those first 3 songs were considered warm up because I was dying! I was completely out of breath and already exhausted. But I was also a fat, out of shape dad with no physical stamina for something like this (the entire reason I came). Despite being out of breath already, I wasn’t going to quit. Even if I was half dead when it was over I was not quitting unless I physically could not move. I don’t remember much else about the first class except a very strong urge to throw up that hit me a couple of songs before the end (which thankfully was the cool down). I was not going to hurl in a class full of ladies. I was not going to hurl in a class full of ladies. I was NOT going to hurl in a class full of ladies. Lucky for me, I did not end up losing breakfast (during or after class). I had survived the first class, and I was extremely tired. After that first class, I experienced soreness throughout my entire body like nothing I had ever done. Everything hurt. It hurt to move. The soreness continued for days. By the time we went for the second class, I was still a little sore. But this time I knew what to expect. That doesn’t mean I knew the routines perfectly, but having done all the moves once already brought a sense of comfort and normalcy. Not everything would be brand new. But it was actually harder the second time. 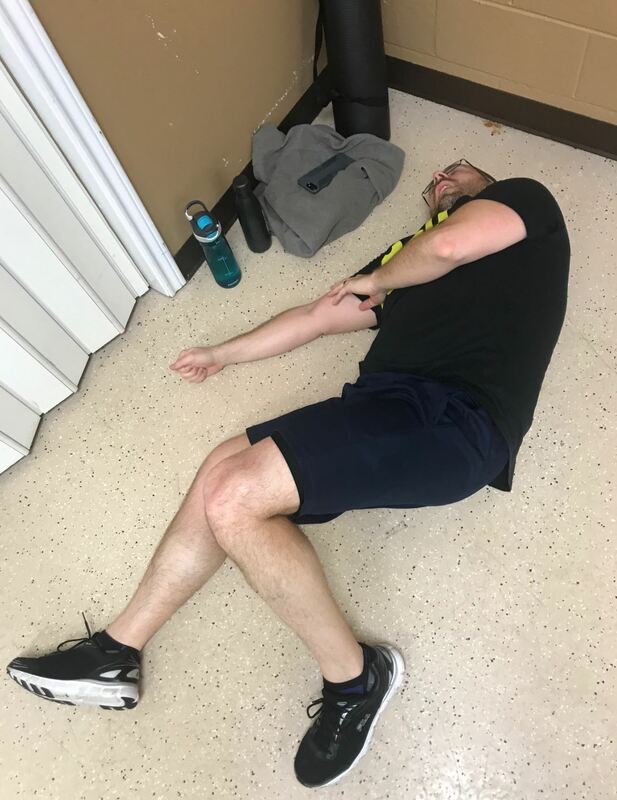 Not only did everything hurt after the second class just like the first time, there was a lot of soreness that needed to be dealt with during the workout as well. But again, I survived. I still felt like puking but was able to avoid it. For a while I struggled with what to eat before doing that kind of work out and exactly how close to class time I needed to eat to give enough time for digestion (and to avoid puking). The instructor was curious from the beginning how I liked the workout and how it had affected me. She coached me through some ideas for the best breakfast possible before working out, and instead of calling her by her first name (Debbi), I settled on just calling her Coach. After all, she was coaching me through this fitness program that was totally foreign to me. Now, it just isn’t right to call her anything else. Saturdays became routine. REV+FLOW was just what I did on Saturday morning. Often times I would be so tired after coming home and eating lunch that I would have to take a nap for a while. It was kicking my tail in a major way more than just about anything I have done (even when I was running). Even though I was sore, I felt better, physically and mentally. My wife and I tried to make it to as many classes as was possible. I really enjoyed getting the exercise, and I never once injured myself. I may not have done everything perfectly, but I was giving it all I had. The crazy thing was not one person ever treated me differently because I was the only male there. I’m not sure why that is surprising, but it surprised me nonetheless. We were told there would be a second round at the beginning of the new year, and classes would be offered more than just on Saturday. As you can probably guess, I was open to doing the next round. My wife and I went off the rails pretty hard during the holidays. There was way too much food consumption, and weekends were so filled with activity we might not have had time for a workout. But all the holidays did was make me mad. It had disrupted the routine I had developed, even if it was only on Saturdays. I wanted REV+FLOW back. And I was excited about multiple classes per week. That meant I could force myself to stop working to go and get some exercise during the week too (when possible). The second round started with a beta class. Those who attended the last session came to a run through of the new playlist. I was able to attend that class as well as the next 5 in a row before missing a class. I’ve not exercised at that intensity level so many days of the week since my days of playing high school tennis. My muscles were extremely sore, and I could often be found walking in circles in the living room at night listening to audio books to ensure I could still move. But I was loving it. In just a few weeks, I felt stronger, and my clothes fit better. In fact, moves like what you see below are not something I thought I would be able to do when the second round began. But it happened. At one point my muscles got so tight I was crooked (as in could not stand up straight). The chiropractor got me fixed and said it was tight muscles. My hip flexors and leg and thigh muscles needed to be stretched better, so I started leveraging my travel foam roller both before and after class along with some Airrosti recommended stretches for low back pain. That was definitely helping the muscles stay loose. I even did a workout or two in a hotel room when I missed class due to travel. My wife told me the ladies asked where I was when I couldn’t make it. They wanted to make sure I hadn’t quit on them. That made me feel great, honestly. I still wasn’t completely sure how they felt (even in the second round) about having one random guy there. Someone made the comment one day that I don’t talk to anyone when I go to class. Here’s what no one seems to understand. When I walk in that building, I enter the zone. I’m there to get stronger, to survive the class without throwing up, but most of all to prove something to myself…that I can do it. And to do that, to focus on doing the moves the right way, it takes every amount of effort and focus I have. When I’m working out, there is no one else. I focus on the instructor and do what I can to get stronger. There will be no lack of effort if I can help it. It’s not personal. It’s just my game face. And…I have to make sure I stretch before and after class so I will be able to walk the next day. At some point in mid-February, I got extremely sick with an upper respiratory infection. I couldn’t work out at all for a couple of weeks. Then I was out of town again. I made it to one class after missing for a few weeks. I was able to do it but struggled a little. It was harder because I was out of practice. Then I got sick again, and my back went out on me. At present I have a bulging disk in my lower back that is keeping me from attending class. But this doesn’t mean I’m quitting, Coach. It just means I’ve been benched until I can get this under control. I want to thank you, Coach, for letting me attend that first time. I want to thank you for creating a welcoming culture even though I was the only guy. And most of all, thanks for pushing me to work harder, reach higher, and get stronger. Because I promise you I got physically stronger in a major way from taking the class. For all the out of shape dads out there, do something to get more activity. Do something that gives you an accountability group. Do something you weren’t sure you could. Don’t think that a certain type of exercise is only for ladies. I assure you there is some benefit for guys as well, and it may be more than you know. But don’t do it because your wife suggested it. Don’t do it because you think you should. Do it because you made the decision to do it. Do it for you. And by doing it for you, you’ll be doing it for your family. And if you are lucky enough to have a woman who loves you as much as my wife loves me, don’t dismiss her suggestions without giving it some thought…even if you are the only guy there. And as for you, Coach, I hope to see you sooner rather than later. But I will be back. Until then, I’ll focus on the things I can do to change the things I temporarily cannot do. It only gets stronger.